Your home roof is likely the largest impervious surface in your garden. Last month (February 2013) we talked about gutters, downspouts and rain chains which can be used to collect and direct roof water. This month and next we consider methods for infiltrating the water from impervious surfaces into the ground. One simple but effective infiltration tool is the rain garden or vegetated swale. Rain gardens/swales capture water that would otherwise run into the storm drains - and allow it to percolate into the ground. They make sense for many home gardens and are becoming increasingly popular throughout the world. What is a rain garden? A rain garden is a small garden where runoff from impervious surfaces (roof, driveway, patio, walkway) is directed. 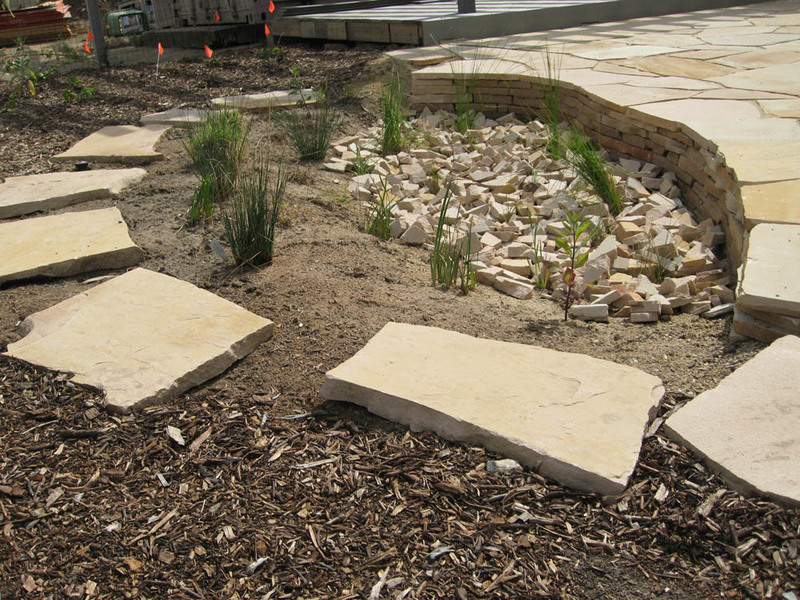 Rain gardens are like leaky ponds – they hold rainwater just long enough for it to soak into the soil. Because they only have standing water right after a rainstorm, you don’t have to worry about mosquitoes and other problems associated with standing water. Rain gardens are often planted with wetland plants that help hold the soil and make the garden beautiful and life-friendly. 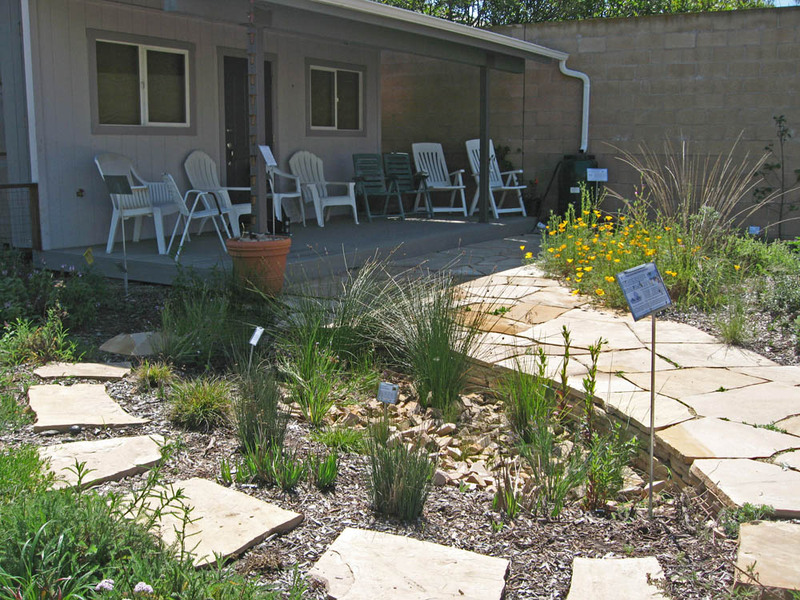 What do rain gardens look like? Rain gardens can be any shape – from round like a pond to linear like a dry stream bed (these are called vegetated swales). The size of the rain garden is based on the amount of water that needs to soak in. The shape depends on your needs and tastes – and the available area. Rain garden designs often have a regional ‘look’. For example, rain gardens in places with summer rain (for example, Pennsylvania) are often kidney-shaped flower gardens located in low areas of the lawn. But there’s no reason that all rain gardens need follow this design. 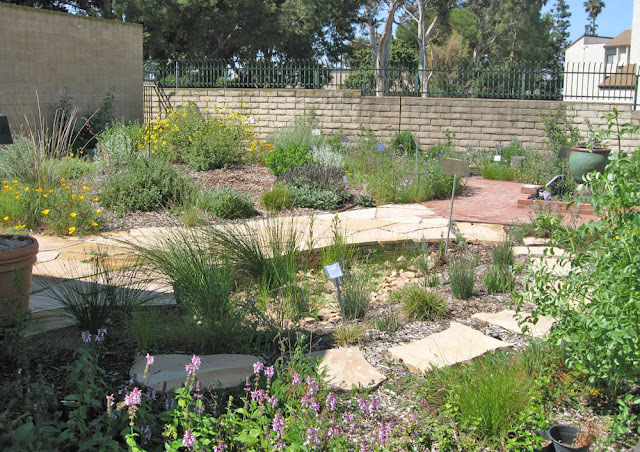 In summer-dry regions like Southern California, rain gardens can be completely dry from late April through October. In these regions, a rain garden can serve a dual-purpose - functioning as a water infiltrator in winter and something else during the dry season. As rain gardens become more common, landscape architects and homeowners alike are developing more creative and functional designs. We suggest you search the internet for designs that inspire and work well with your lifestyle, climate and garden. Does my rain garden need to be planted? No, in fact some very successful rain gardens contain no plants at all. However, there are several good reasons to select a planted rain garden. First, the plants serve as habitat for birds, butterflies and other insects. They may even provide food for your family. So, a planted rain garden is usually more life-friendly than one with no plants. A second reason to plant your rain garden is that it will be cooler. In our climate, planted areas play an important role in keeping gardens cooler during the hot, dry summer. If you live in a mediterranean climate, this can be an important advantage. Another reason to include plants in a rain garden is that their roots help rainwater infiltrate more quickly. Roots help keep the soil texture open, allowing water to infiltrate better. This is obviously an advantage in a rain garden. Finally, a rain garden provides the ideal place to grow plants that like a little extra water. These include some wonderful native pond-side and stream bank plants. Planting a rain garden with these plants – and using rainwater to water them during the rainy season – allows you to enjoy these beautiful plants. Check your soil drainage to determine if your soil is suitable. Dig a 1x1 foot hole and fill it with water. Let the water drain out completely. Fill the hole again and check after 1 hour. If the water drains at least 1-2 inches per hour your soil is suitable for a rain garden. 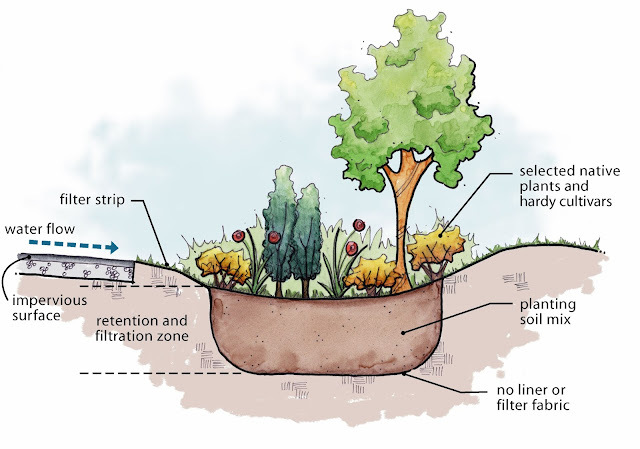 Choosing a location is key to designing a successful rain garden. The location should either be near the impervious surface(s) it drains or in a place where water can be easily diverted to it. Ideally, a rain garden that infiltrates water from a large surface (such as a roof) should be at least 8-10 ft. rom any structures or utility lines and 3 ft. rom sidewalks and walkways. Rain gardens that drain patios or walkways are usually located fairly close to the surface they drain – usually 1-2 feet away. In Mother Nature’s Backyard, the water from half of our small roof runs down our rain chain, into an infiltration pot and then directly into our rain garden. Ideally, the rain garden would be located a bit further from the structure. However, the small amount of drainage area, coupled with the depth of our rain garden, made our location feasible. Determining the size and depth of the rain garden is fairly easy. First you need to determine how much rain falls per hour during a good rainstorm. Then you convert this amount to cubic feet. In our area of Southern California, we rarely get sustained rainfall that exceeds ¾ inch per hour. Therefore a rain garden in our area should be able to contain at least 3/4 inch (.0625 cubic ft.) of rain that falls on the impervious drainage surface. This is probably the least amount of rain fall you should plan for – even in the desert, a rainstorm can drop an inch or more of rain in an hour. If you live in an area with heavier rainfall, you’ll need to increase your estimate accordingly: 1 inch per hour = 0.083 cubic feet; 1.25 inches = 0.104 cubic feet; 1.5 inches = 0.125 cubic feet; 1.75 inches = 0.146 cubic feet. To convert any rainfall per hour to cubic feet simply multiply the rainfall amount by 144 and divide this number by 1728. 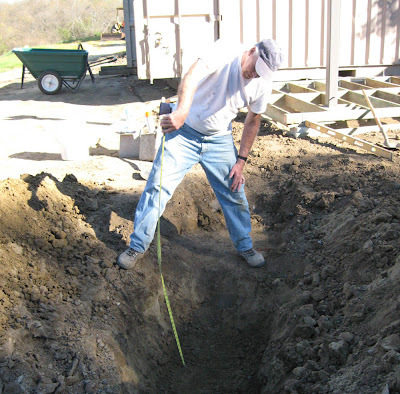 Next determine the area of the impervious drainage surface by multiplying the length of the surface times its width. For example, a 20 by 30 ft. roof has an area of 600 square feet. Multiply this by the cubic feet of rainfall (0.0625 in our area) to get the total cubic feet of water from the drainage area (600 x 0.0625=37.5 cubic feet). This is the amount of water your rain garden will need to contain before it infiltrates into the ground. 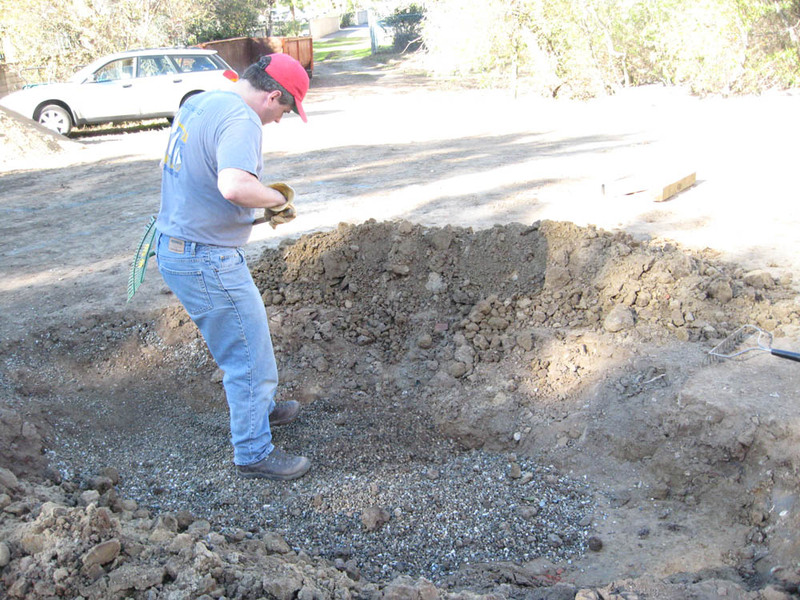 Most home rain gardens are 1-3 feet deep (with most of the depth filled with gravel or dirt – see below). Decide on a depth and divide the cubic feet of water (37.5 cubic feet) by the depth (2 feet) to get the surface area of your rain garden (37.5 / 2 ft. = 18.75 square feet). In this example, an oblong rain garden that is 3 ft. wide by 6 ½ feet long and 2 feet deep will do the trick. It’s prudent to make your rain garden a little larger than the calculated size and to also plan an overflow area in case of heavy rainfall. Mother Nature is full of surprises these days! The shape of the rain garden may be dictated by the site or designed by you. Gardeners often find that rounded shapes are most pleasing; but the design depends on your needs and the design of your home and garden. You can easily lay out the basic shape for your rain garden using a garden hose. As long as the size is adequate, the shape of the rain garden is up to you. Our rain garden is oblong with rounded edges and a dry-stone wall on the walkway side to provide stability and a decorative appearance. Digging the rain garden can usually be done with a shovel and a little effort. We had a little mechanical help, but did much of the digging with picks and shovels – even in our heavy, debris-filled soil. The excavated area should have gently sloping edges. Pile the excavated soil around the edges to create a small berm around the rain garden. You can see our fully excavated rain garden above. Because our area in Mother Nature’s Backyard is limited, our rain garden is fairly deep - about 3 ½ feet at its deepest point. 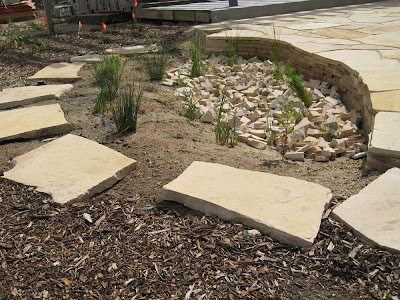 Because the rain garden is filled with gravel and a layer soil, only the only the top part is visible (see photo below). of soil was placed over the gravel layer. Fill the bottom of the rain garden with at least 6-12 inches of gravel. This will help the water to infiltrate better. If your rain garden is deeper than 2 feet you can use more gravel. 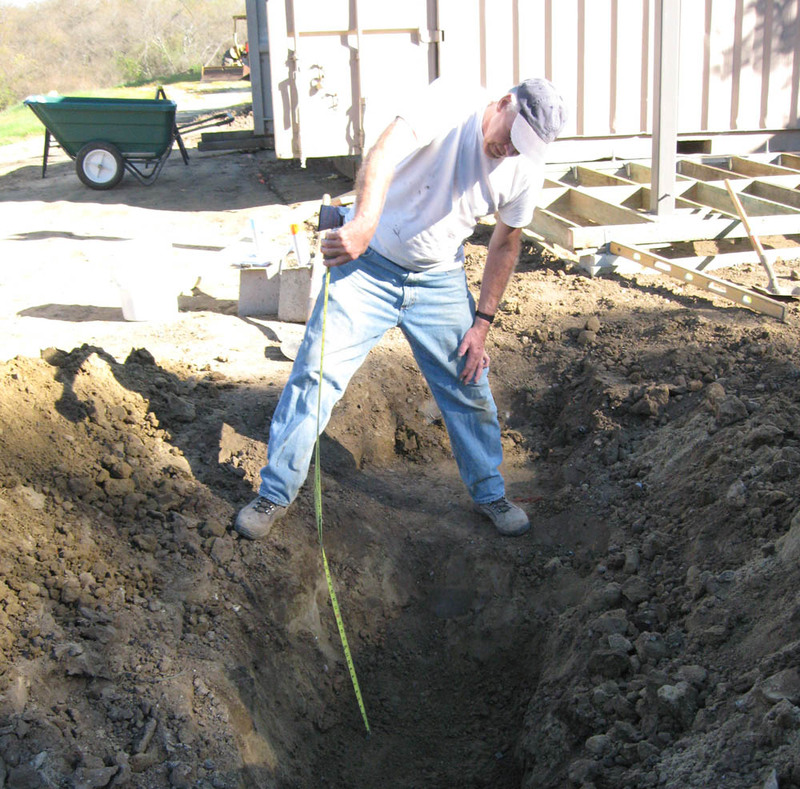 The surface of the gravel layer should be at least 8-10 inches below the level of the surrounding soil. Rake the gravel to make it level. Cover the gravel with 4-6 inches of garden soil (use the excavated soil). This will be sufficient for the bottom plants, many of which will grow through the gravel layer and into the soil beneath the rain garden. Smooth/compact the berm to create gently sloping edges. Plant the rain garden with appropriate plants (see below). Mulch around the plants with an appropriate mulch. Depending on the plants, this may be an organic or inorganic mulch (see our July 2012 posting on ‘Garden Mulches’). In Mother Nature’s Backyard we used chunks of sandstone left over from the stone pathways to create a color-coordinated inorganic mulch at the bottom of the rain garden. The plants on the berm are lightly mulched with wood chips until they grow to cover the area. Plants for the bottom of the rain garden. These plants will be briefly flooded after a rainstorm and the ground will be seasonally moist. You need to choose plants that normally grow along streams or around ponds and lakes (riparian plants). These plants are often short (1-3 feet) and grass-like. Some typical examples are rushes, spike rushes, and some annuals and perennials like annual Monkeyflowers (Mimulus) and even Miner’s Lettuce (see February 2013 Plant of the Month). Plants for the upper sides and berm. These are plants that like damp soil in winter and spring. This area will likely be too damp for the most water-wise local plants (like local native Salvias), particularly if your soil drains slowly. However, there are many lovely plants to choose from. These range in size from grasses and sedges to large shrubs and even trees. Last month (February 2013) we talked about California native plants that can be eaten as raw or cooked greens. We covered some general topics like growing and harvesting native greens; and we also provided a list of California native greens plants. If you haven’t read that post yet, you might want to start there. Each type of wild greens has a unique flavor that’s difficult to describe. You’ll probably love some and not care for others. So assess the flavor each time you use a new species. If the greens can be eaten raw, taste a little sample (see the Native Greens List referenced in February 2013). If you like the taste, then include them in salads, tacos, sandwiches or any other situation where you regularly use lettuce or raw spinach. Miner’s Lettuce is a mild greens plant that most people like uncooked (see Plant of the Month, February 2013). We also suggest that you taste test new cooked greens before you include them in a recipe. 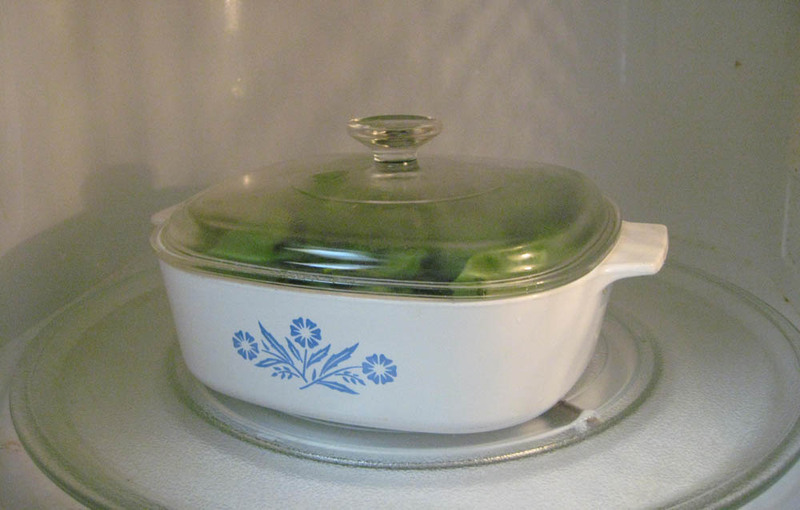 Steam a few leaves in the microwave or on the stove and try them. The taste for greens is truly individual; some of us like/use greens that are stronger flavored while others prefer the mild types. If the flavor is too strong or bitter, you might want to try boiling a few leaves, changing the water and then boiling again. This usually makes the greens milder tasting; some of the flavor chemicals leach out and others are changed with boiling. Cooking with wild greens is fairly straightforward. On the other hand, the unique flavors of California native greens inspire the creative cook in all of us. We’ve provided some favorite recipes below to get you started. But you can substitute wild greens in most recipes calling for spinach, kale, chard or wild greens. Many traditional regional recipes include native greens. So try our native varieties in any favorite greens dish. We suggest you used the milder tasting greens (like Miner’s Lettuce, Island Mallow (Lavatera) and young Atriplex (Quailbush and other) in recipes calling for spinach. Other mild greens include Mimulus species, Sidalcea, Camissonia species and Oenothera elata. Note that young greens are almost always milder than older greens. Substitute more piquant greens in recipes calling for kale, chard or wild greens. These are basic recipes for preparing any type of greens. The cooking times will vary depending on the type of greens; you’ll have to keep testing for tenderness until you become experienced with an individual type of greens. Many cooks like to add ingredients to flavor or season the greens. Some typical additions include sautéed garlic or onions, mushrooms or peppers; lemon juice, vinegar or a favorite bottled sauce; salt, pepper and other spices; toppers like nuts, sesame seeds, shredded cheese, etc. Note: if desired, you can sauté 2 cloves of garlic or ½ cup chopped green onions in the oil before adding the greens. Seasonings (optional): salt, pepper, lemon juice, vinegar, etc. Wash greens, remove thick/coarse stems and cut into 1-2 inch pieces. Steam over boil water or in the microwave for 2-3 minutes. Greens should be wilted but not yet soft. Remove from heat. Plunge greens immediately into very cold (ice) water. Remove from water when cooled, blot dry and freeze as you would any vegetable. To use, thaw then sauté, steam or boil until fully cooked. The cooking time will be shorter than for fresh greens. Native cooked greens can be used in so many ways. Here are a few recipes to get you started. Wash greens, remove tough stems (if any) and cut into 1-2 inch pieces. Prepare green using method of choice. Cool the greens and slice them again to make small pieces. In a bowl whisk the eggs and seasonings. Stir in the prepared greens. Heat oil in frying pan. Pour in the egg/greens mixture and cook over low heat (pan may be covered to help eggs to cook). When first side is golden brown, loosen the frittata, then invert frying pan over a plate. Slide the frittata back into frying pan to cook the second side. Carefully slide the finished frittata onto a plate and serve – hot or warm. Wash greens. Remove tough stems (if any) and chop. Heat oil in large, heavy pot. Add onions and cook until softened – 4-5 minutes. Add greens, and cook until slightly wilted. Stir often so it doesn’t burn. Add water and cook until greens are tender – about 5-7 minutes. Drain. Wash greens. Remove large, tough stems and chop into small/medium pieces. Mix the flour, polenta, milk and egg together in large bowl. Cover it and let it rest for 30 minutes. Cook greens and garlic in boiling water for about 10 minutes until tender. Remove from heat and plunge greens into cold water to blanch. Pat greens dry and add to flour mixture. Add salt and pepper to taste. Form mixture into rounded fritters about ¾ inch thick. Heat olive oil in frying pan over medium heat. Cook the fritters until golden brown – about 5 minutes per side. You may want to cover the frying pan to insure that fritter cook through. Serve warm as a snack, appetizer or side dish. Nice dipped in plain yoghurt. Wash greens. Remove large, tough stems and chop into small/medium pieces. Let drain in a colander. Heat the butter and 1 tablespoon of olive oil in a large heavy skillet over medium heat; add the chopped shallot. Sauté the shallot gently, stirring until it starts to turn translucent. Shake most of the water off the greens and add to the pan, using tongs to turn it as it wilts and cooks (about 2-4 minutes). Season the spinach with a pinch of salt. Transfer to bowl to cool. Chop fresh herbs and set aside. Whisk the eggs lightly in a medium to break them up, then whisk in the flour, nutmeg, cheese and salt and pepper to taste. Mix in the herbs. Chop the cooked greens into small pieces. Add to batter mixture and mix well. Wash greens. Remove any tough stems and chop. Heat olive oil in a large, heavy pot or sauté pan on medium heat. Add greens and sauté for 2-3 minutes until greens are wilted. Add water and fresh herbs. Cover and simmer on medium heat for 5 minutes. Remove cover, remove Salvia and Artemisia sprigs (if used) and continue to stir until water has steamed off. Remove from heat. Prepare your favorite biscuit mix (or use refrigerated biscuits). Grease a 10-12 inch pie pan. Line the bottom with 1/3 inch layer of biscuit mix – press with fingers to form an even layer. Pat greens dry and spread evenly over the biscuit mix. Roll out the top layer of biscuit mix to fit the top of the pie pan. Gentle place over the greens. Bake at 350° F for about 12-15 minutes – until top is golden. Let cool 5-10 minutes, slice into wedges. Eat warm or cold – tasty either way. Wash greens. Remove tough stems and chop into 1 inch pieces. Prepare greens by sautéing, steaming or boiling. If greens are very tangy we suggest you boil them in several changes of water until they suit your taste. Cool the greens and blot dry. Grease a 10 x 6 x 2 inch baking dish (or larger for thinner slices – up to 9 x 13 x 2 inch). Combine eggs and milk. Beat in flour, baking powder and salt. Whisk until smooth. Stir in greens and shredded cheese. Pour into greased pan, spread evenly. Bake at 350° F until golden brown – 25-30 minutes. Slice and serve. Makes a nice side dish or appetizer. Wash greens and remove tough stems. Place all ingredients in a blender or food processor. Process on high until it resembles a smooth paste. Taste and add more salt to taste (if needed). Place in a covered container and let sit for 2-3 hours to let the flavors age. Use within a week in any dish calling for pesto. Can be frozen for later use (freeze in an ice-cube tray to get serving-sized portions). Wash greens. Remove tough stems and chop into 1 inch pieces. Prepare greens by sautéing, steaming or boiling. If greens are very tangy we suggest you boil them in several changes of water until they suit your taste. Cool the greens and blot dry. Whisk together mayonnaise, sour cream and soup mix. Add cooled greens and mix well. Chill overnight in the refrigerator. Serve as a dip with raw vegetables, bread chunks, chips etc.